Debris-covered glaciers are receiving increased attention for their role in the cryosphere and hydrology of high elevation catchments. However, their actual melt dynamics, rates of mass loss, and contribution to streamflow are still poorly understood. Under a project funded by the British aid agency DFID, researchers from ICIMOD and ETH are examining debris-covered glaciers through remote sensing studies in the Shimshal Valley of Pakistan. analyse the reconstructed changes as a function of possible controlling factors. Resource personnel for the training are Dr Francesca Pellicciotti (ETH), Ms Anna Chesnokova (ETH), and Mr Alvaro Ayala (ETH). 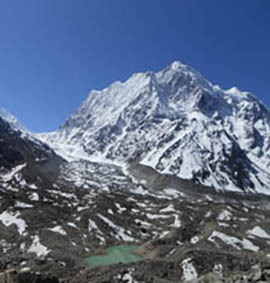 Debris-covered Langtang Glacier and Langshisha Ri (6,427 m), Langtang Valley, Nepal.